Monorails – Summit Anchor Co.
Monorails can be used to support suspended powered platforms, one-man cages, or one-man rope descents. Monorails may be preferred where spaces do not allow for access through building features or where minimal penetrations are desired. 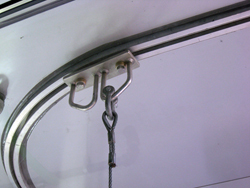 Use of a monorail for suspended maintenance could reduce the number of times suspension and fall arrest ropes have to be pulled up and down the building face, reducing wear and the chance of hardware damaging windows or building facades. Monorails incorporate a track, which typically runs along the facade of a building; a trolley, which can move freely along the track; and supports located at intervals, which secure the track to the building. The track can be straight or curved, with a minimum 3′-0” radius, to fit any space or go around corners. The design must be able to incorporate fall protection for maintenance workers to safely approach and rig to the monorail as well as an anchorage point to which the worker can secure his lifeline. Typically, access is gained to the monorail through an operable window, hatchway, or an adjoining safe surface such as a setback or rooftop.